"Frosting mix and walnuts are used in this version of the classic cake with the melted chocolate center. " Preheat oven to 350 degrees F (175 degrees C). Grease and flour a 10 inch Bundt pan. Measure 3/4 cup of the frosting mix for the chocolate glaze. Set aside. In a large bowl, cream together the butter and sugar until light and fluffy. Beat in the eggs one at a time, then stir in the remaining frosting mix and flour, mixing just until incorporated. Fold in the nuts. Pour batter into prepared pan. Bake in the preheated oven for 60 minutes. The top of the cake will form a brownie like crust before it is done. Allow to cool for 60 minutes in the pan, then cool completely on a wire rack before glazing. 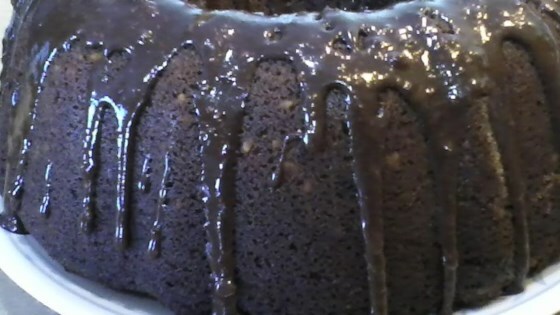 To make the chocolate glaze: Mix together reserved 3/4 cup frosting mix and 2 tablespoons boiling water, stirring until smooth. Thin with additional boiling water if necessary to reach desired consistency. Spoon glaze over the cooled cake. I really like this cake. Jiffy still makes the frosting mix. www.jiffymix.com if you can't find in the store.